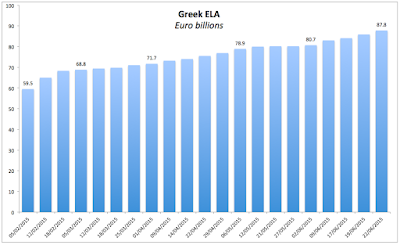 Yesterday, I noted that Greece is now on a daily drip of liquidity injections by ECB via ELA (http://trueeconomics.blogspot.ie/2015/06/21615-ecb-ela-for-greece-welcome-to.html) and so here we have the latest. 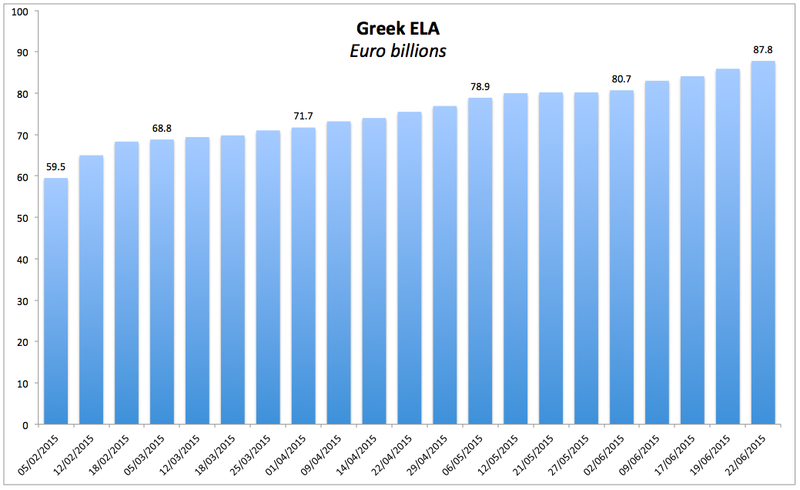 Per reports, ECB hiked Greek ELA today to EUR87.8 billion. Meanwhile, there are rumours of a 'deal' being agreed, albeit only 'in principle'. Draghi is meeting Tsipras later today and we will also have an emergency summit. So a beehive of activities all over the shop.